The wind blows grit and sand and it stings exposed skin on Kellie's arm. But she can feel it. That's what matters. To feel anything and to think about it is better than to dwell on the void that gnaws her insides like a boring beetle. Her unit is no more. All that remains are herself, her sister's children, and her own infant that sleeps in her arms, bundled against the wind. Her sister's children are away from this place, retrieved by Dionys Unit, their father's people. Apollo Unit is here for her. She feels the approach of their multi-rider. She is not ready to go. She can not leave the site where she last saw her own alive before Black Widow took them. An explosion and a collapse and all evidence of Hermes Unit is gone... burned and buried. Kellie will never see them again. Black Rim can be merciless and greedy. She rarely releases her dead. "You made good time," Athena Marie's ancient voice creaked through her scarf as she greeted Logan and Brett. "Dionys got here before we did?" Logan tightened his face mask against the smell of smoke and sulfer. "And they are gone already. Black Widow is still murmuring. She may speak again." Athena turned from Logan to his son and focused her one good eye on him. "Brett, you are ready to take Kellie as lifemate for as long or short as this wretched life may be?" "She chose you. And you accept?" "Get her and get out. Widow may open her mouth and swallow us as well." Kellie sat in the ash looking more like a Nomad cradling her child than a transient miner. She faced Black Widow, head turned up toward the newly collapsed rim that now jetted acrid smoke into the sky through sharp whistling cracks. "We have come." Brett said. Kellie didn't move, not even to look up at him. Brett sat next to her in the ash. There was nothing more to say. Never had so many been lost so quickly in one incident. The weight of the loss hadn't fully impacted him yet. So many faces that he is used to seeing at gatherings, he will not see them any more. Though there will be memorial stones set up for them, no graves will be dug. 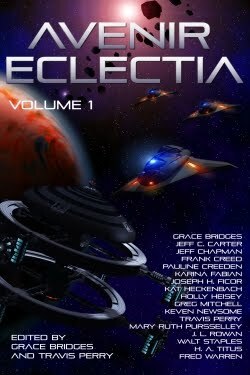 Black Widow has already devoured them into the bowels of Eclectia. Brett could not imagine what those men, women, and children faced as they went under. It must have been a gaping hell of brimstone and flames. Black Widow murmered again beneath them. Brett shot up to standing at his first sense of the vibrations. Brett bent over and spoke as gently into her ear as the wind and whistling would permit. "We must go on." Kellie nodded once but made no attempt to get up. The Widow doesn't always give warnings. It is foolishness to ignore her when she does. But it is wrong to disturb the grieving of a new widow and to invade the place of her sorrow. Brett wound never do it if there was no danger. But another tremor rumbles under his feet, another warning, from an ancient Widow to a new one. If Kellie won't heed it for herself, she must do so for the sake of her child. Brett leaned over again, "We must go now." He put his hands on her arms and gently lifted. To his relief, Kellie didn't resist but cooperated by pushing up with her legs, though her arms never let loose of her infant. Brett guided her to the multi-rider where his father and sister waited, the staredown between Black Widow and her most recent victim has been broken. Kellie looks up into the sky as she walks with Brett to the multi-rider. The words of the song they will sing at the time of remembering and raising of the stones flows slowly through her mind. Kaye Jeffreys dedicates this story and the song below to the memory of Walt Staples.